What a wonderful long weekend! We were able to spend a lot of time with family and also get a lot of work done around the house. I did quite a few craft projects and felt so relaxed. I'm eager to get back into the routine of a normal work week though. 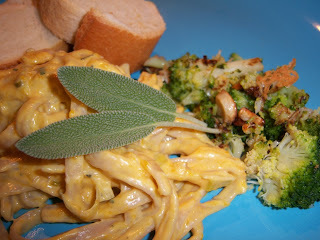 Here is an awesome pasta dish made with whole-wheat fettuccine and a sauce made from pureed butternut squash and leeks. It also contained sage. With our herbs now moved inside, it was a perfect way to use the sage. Next time, I would cut down on the heavy cream and use skim milk instead as the sauce was a bit heavy in fat. On the side, we sauteed broccoli and garlic, a "go-to" veggie dish for us. Bring a large pot of water to boil for the pasta. 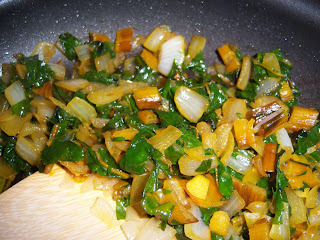 In a large skillet, melt the butter over medium heat, add leeks and cook for 5 minutes. Add butternut squash and cook for an additional 3 minutes. Add vegetable broth, cover pan and steam the vegetables until just tender, about 5 minutes. Stir in the cream and sage until mixed well, remove from heat. Salt the boiling water and add fettuccine and cook until al dente, 3 minutes for fresh pasta or 10 minutes for dried pasta. Drain and return to the pot. Add the squash-leek sauce and the Parmesan cheese. Toss well. Season with salt and pepper. Transfer all to a large, warmed bowl or platter and serve immediately. Pass extra grated cheese for topping. For variety, try adding freshly ground nutmeg. Happy Thanksgiving to all you in the United States! I am so super excited for 4 days off of work. I plan to work on some sewing projects, shop for some craft projects, and do some general organization around the house. We're only doing one Thanksgiving this year, which is nice as we typically do 2 Thanksgivings which results in Ryan and I being super stuffed and stressed out about spending equal amounts of time with each family. This year, we're doing Thanksgiving at Ryan's parent's house. I'm making sweet potatoes and pumpkin pie. Yum! Saturday is my sister's birthday, so we're heading over there for lunch and Tres Leche Cake, which I've never tried, but heard it's awesome. Recently, I was flipping through some old Cooking Light magazines and came across a recipe for Sesame Crusted Tofu and realized we had the ingredients. We used Ener-G instead of the eggs. We made a veggie stir-fry out of random veggies we found in the fridge. Everything turned out great and this was pretty quick and easy to make. Made for tasty leftovers too! Again, Happy Thanksgiving...can't wait to see what everyone has to eat! Ryan and I have found our new favorite meal and it is so easy to make! 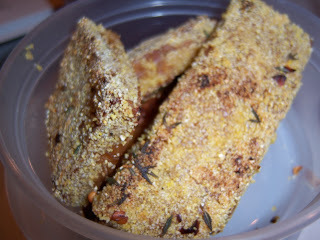 We both really like tempeh, so when I got the Students Go Vegan cookbook, I was eager to try Crusted Tempeh Cutlets. First, you make a marinade and bake the tempeh in it. This step is super easy to do the night before. Then, when you're ready to "crust" the tempeh, you brush it with mustard, coat it in a cornmeal mixture, and cook them in a skillet until browned. These are awesome with barbecue sauce! when I remembered to take a picture. 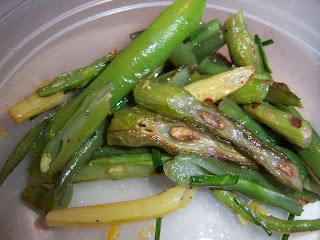 Another easy recipe is the Green Beans with Citrus Zest. This recipe was in Food & Wine by Heidi Swanson. So easy and so yummy! You don't even need to steam these beans separately. I love the slightly different taste that this dish gives the green beans. Be warned that adding hot oil and water does make for a dangerous situation, so have your cover ready! In some of our final crop share boxes, we'd been receiving Swiss Chard. 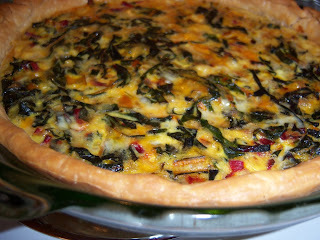 In one of the newsletters, there was a recipe for Swiss Chard Quiche Pie. I wasn't really sure an egg pie was going to be good, but thought I'd give it a try. We halved the recipe and quickly became addicted! 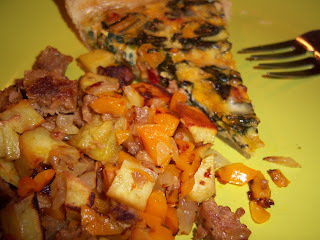 We visited the farm and picked up some more Swiss Chard just so we could make this again. It's seriously some good stuff! I told you there would be another hash dish! 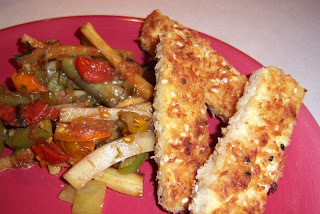 This one was super easy from the Students Go Vegan cookbook. Basically you cook a diced sweet potato and then saute that with some onions, peppers and veggie burgers. It's awesome and I plan to make it again.